This is one of 3 beautiful holiday homes overlooking the Eiderenge and a beach right outside the door. 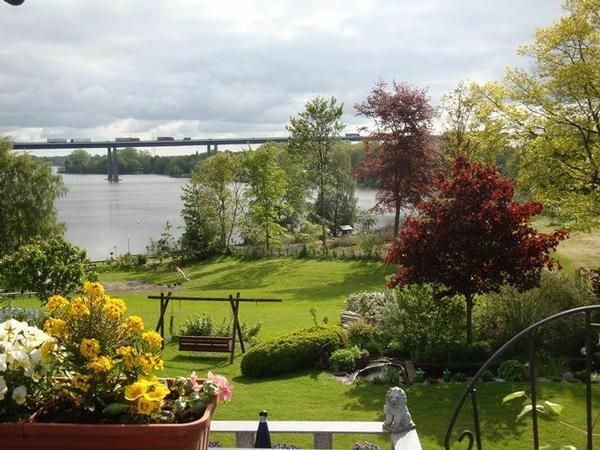 Wonderfully located on the Kiel Canal. This cozy guesthouse is 90 square meters and offers enough space for 4 to 5 people. Everything is senior-friendly and barrier-free. It has 2 bedrooms each with a double bed 180x200. In one bedroom is also a comfortable sofa bed 80x195. From the living room with dining area, living and reading area with the open country kitchen you have a magnificent view over the water. The bathroom with floor shower, large wash hand basin and toilet is spacious and well equipped. In addition, there is a guest toilet in this house. In addition to the covered entrance you have a utility room in the grill, umbrella and garden chairs are housed. Through the park-like complex they reach the beach right outside the door with the attached children's playground. Pet: once per object Costs amounting to 40 EUR (Mandatory). Borgstedt is a small village in the heart of Schleswig Holstein with its own bakery for breakfast rolls and a beautiful beach and idillisch fishing spots. From this great starting point you can plan your day trips to Denmark, Hamburg, North or Baltic Sea.